The current coat o airms o Austrick, albeit athoot the broken chains, haes been in uise bi the Republic o Austrick syne 1919. Atween 1934 an the German annexation in 1938 Austrick uised a different coat o airms, which consistit o a double-heidit eagle. The establishment o the Seicont Republic in 1945 saw the return o the oreeginal (First Republic) airms, wi broken chains addit tae seembolise Austrick's liberation. Gules a fess Argent, escutcheon on the breast o an eagle displayed Sable, langued Gules, beaked Or, crouned wi a mural croun o three visible merlons Or, airmed Or, dexter talon hauldin sickle, sinister talon hauldin hammer, baith talons shackled wi chain broken Argent. Thare are twa different versions o the airms: Ane version in accordance wi the Federal Constitution, in which the eagle is representit plain black, an anither mair airtistic version in which the eagle's feathers are detailed. Baith versions are uised in parallel. Discussions aboot the airms hae been triggered in the past bi differin poleetical interpretations, especially bi the uise o the hammer an the sickle an the broken chains, syne the crossed hammer an sickle are a widespread seembol o communism, as is the breakin o chains. Surveys hae housomeivver confirmed, that unnerstandin o the actual seembolism o the airms is widespread. On the ane haund the airms serve as a new republican seembol, on the ither as a modified version o the historical Habsburg airms. The current version o the airms is aften regardit as bein reminiscent o the double-heidit eagle o the Habsburg monarchy. Accordin tae this interpretation, the single heidit eagle alludes, in the sense o the removal o the left haund, "Hungarian" heid, tae the removal o the eastren pairt o the Habsburg Empire. 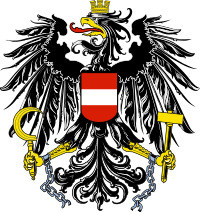 Housomeivver, Addendum 202 tae the 1919 Law on the State Airms an the State Seal o the Republic o German Austrick states expressly that the "new" single heidit Austrian eagle is based no on the double heidit eagle (seembol o the Habsburgs syne 1804, an previously o the Holy Roman Empire), but rather on the "seembol o the legions o the Roman Republic", the Aquila. The Austrian federal states hae housomeivver retained pre-republican heraldic tradeetions (maistly heraldic images frae the Middle Ages, but an aa diverse accoutrements such as archducal an ducal hats, an knights' helmets). On 31 October 1918, the cooncil o state agreed upon the colours o the republic (red-white-red) as well as the new coat o airms componed personally bi chancellor Karl Renner. The coat o airms wis componed quickly due tae the need for haein a seal at the peace talks efter Warld War I. The coat o airms consistit o black touer representin the bourgeoisie, twa crossed reid hammers representin wirkers an a gowden wreath o lugs o corn representin farmers. The colours black, red an golwd wis deliberately chosen acause thay wur the German naitional colours. The new coat o airms wis housomeivver athdrawn as it wis met wi hivy criticism for instance bi Adolf Loos an heraldists. The proposal wis too seemilar tae commercial advertisin. A decision bi the cooncil o meenisters on 8 Mey 1919 replaced the touer airms wi the eagle. The coat o airms haes been the main motif o mony collector coins, ane o the maist recent bein the 20 Euro Post War Period coin, mintit on 17 September 2003. The obverse o the coin shows the airms flanked bi the Austrian banner an the European Union banner. Wikimedia Commons haes media relatit tae Coats of arms of Austria. This page wis last eeditit on 29 Juin 2016, at 21:22.